Nikon has announced five new products including the Nikon 1 J4 with a waterproof case and an underwater speedlight plus the Android-based Coolpix S800c and a DX-format 18-300mm VR zoom. The Nikon 1 J4 has an 18.4-mmegpixel, high-speed AF CMOS sensor with no low-pass filter coupled with the latest EXPEED 4A image-processing engine. The feature list includes TFT LCD touch screen, built-in WiFi, 1920x1080/60p full-HD movies. Autofocus uses 105 focus points with phase-detection and 171 with contrast detection. Focus points are distributed over a broad range of the frame, Nikon said, to "ensure precise acquisition of moving subjects." With focus locked it can capture 60 frames per second or 20 fps with autofocus tracking. System 1-dedicated underwater accessories, including a waterproof housing and underwater speedlight, were also announced. With a 12x optical zoom, 16.0-million pixels and a backside illumination CMOS sensor, the Coolpix S810c also features Android and Wi-Fi support to upload images to the Web directly from the camera "using familiar operations similar to those used with smartphones." And a GPS radio records location. A Nikon Image Space is pre-installed on the camera. A new comment function allows you to add comments to the image immediately after capture. Playback mode includes a Timeline view to view images in chronological order. The S810 is available for pre-order at $346.95 from Adorama. Covering the equivalent of a 27-450mm 35mm range, the new AF-S DX Nikkor 18-300mm zoom offers that longer range in a compact, lightweight housing. The lens also features Nikon's image stabilization technology which, the company said, delivers a 4.0-stop increase in shutter speed. The 18-300mm zoom is available for pre-order at $896.95 from Adorama. Details for all the product announcements are in the news releases below. TOKYO -- Nikon Corp. has released the new Nikon 1 J4, the latest addition to the J series of Nikon 1 advanced cameras with interchangeable lenses that propose new forms of imaging expression. The Nikon 1 J4 is a model with which performance with tracking of moving subjects that exceeds that of dSLR cameras and advanced shooting functions with excellent image quality that makes full-scale photography possible, have been incorporated in a compact and lightweight body. It offers 105 focus points with phase-detection AF and 171 focus points with contrast-detect AF. 105 densely packed focus points positioned over a broad range of the frame ensure precise acquisition of moving subjects. The Nikon 1 J4 supports high-speed continuous shooting at the world's fastest continuous shooting rate of approximately 20 fps with AF tracking and up to 60 fps when focus is locked. Ultra high-speed AF capable of capturing the perfect moment, ultra high-speed continuous shooting and Best Moment Capture mode useful when it is difficult to gauge the best time to press the shutter-release button enable optimal response for capturing subject movement or fleeting expressions. Equipped with 18.4-million pixels, a super high-speed AF CMOS sensor with no low-pass filter and the latest EXPEED 4A image-processing engine, the Nikon 1 J4 offers superior image quality. It is also equipped with a number of advanced features that allow users to easily capture images as intended. Among these are a TFT LCD touch screen that enables intuitive operation, built-in WiFi for simple transfer and sharing of high-quality images and a variety of functions for recording 1920x1080/60p full-HD movies, including Fast Motion, Jump Cut and 4-second Movie. What's more, two new dedicated Nikon 1 accessories will also be released at the same time as the Nikon 1 J4: the WP-N3 Waterproof Case and the full-scale Underwater SB-N10 Speedlight that allows users to fully enjoy the new values of the Nikon 1 system with underwater photography. Densely arranged focus points. Very dense arrangement of 105 focus points with phase-detection AF and 171 focus points with contrast-detect AF ensures precise acquisition of the intended subject with dense coverage over a broad range of the frame. The world's fastest high-speed continuous shooting at approximately 20 fps with AF tracking and high-speed operation with a shorter shooting time lag. The superior AF-tracking performance of the Nikon 1 J4 enables capture of even moving subjects in sharp focus. At approximately 20 fps, the Nikon 1 J4 also boasts a high-speed continuous shooting rate that exceeds that of dSLR cameras and is the world's fastest. This, along with an even shorter shooting time lag, ensures certain capture of decisive moments. New function for high-speed continuous shooting: Active Selection. 20 frames are automatically recorded at high speed shortly before or after the shutter-release button is fully pressed. From these, users can choose the best shots for storage. The Nikon 1 J4 captures images exhibiting excellent detail and very little noise over a broad range of sensitivities, from ISO 100-12800. In addition, it is equipped with a noise-reduction function that effectively suppresses noise, even with shooting in dark surroundings, by taking multiple shots that are then combined to create a single photo exhibiting superior image quality. TFT LCD touch screen monitor. The Nikon 1 J4 is equipped with a 3-inch, approximately 1037k-dot, electrostatic touch screen with which touch operations can be used to focus and track subjects, making shooting simpler and more intuitive. Settings and imaging functions that make the most of touch operation. FEATURE MENU: By simply pressing the feature button on the multi selector during shooting or with image playback, detailed settings that can be quickly adjusted are displayed. In addition to adoption of simple icons that are very easy to see and read and the ability to precisely specify settings such as shutter speed, aperture value and ISO sensitivity, users can also choose from five shooting modes (Auto, Creative, Best Moment Capture, Motion Snapshot and Advanced Movie). CREATIVE PALETTE: Users can preview creative effects such as brightness, vividness and white balance in real time by rotating the palette displayed in the monitor. Images exhibiting the desired results can be captured by simply pressing the shutter-release button when the preview display reflects the user's intent. Built-in WiFi. Built-in WiFi allows users to easily transfer high-quality still images recorded with the Nikon 1 J4 to a smart device, from which they can be shared. 1920x1080/60p full-HD movie with built-in vibration reduction function. 1920x1080/60p full-HD movies up to approximately 10 minutes in length can be recorded. The electronic vibration reduction (e-VR) function built into the camera can be used to process movies to reduce the effects of camera shake that occurs with movie recording. Advanced Movie mode that stimulates creativity. Functions that support recording of original and creative movies that users will want to share have been added to Advanced Movie mode, which allows users to record movies in [P], [S], [A] or [M] movie exposure mode. FAST MOTION: Fast-motion movies that play back at about four times normal speed are recorded. Playback time is one quarter the recording time. JUMP CUT: Recording pauses every other second for a drop-frame effect. 4-SECOND MOVIE: Recording automatically stops after four seconds. This creates a short movie suitable for posting on social networking services and the like. In addition, up to eight clips can be joined into a single movie using the Combine 4-second Movies option in the playback menu. Auto Image Capture during movie recording. The camera records full-sized still images automatically while movies are being recorded. The maximum number of photos that can be taken during recording of a single movie is 20. Improved Motion Snapshot. In Motion Snapshot mode, simply pressing the shutter-release button records a still image and about 1.6 s of slow-motion movie footage before and depending upon settings after, the user presses the shutter-release button. With the Nikon 1 J4, ambient sound can also be recorded with Motion Snapshots. In addition, the camera can be used to combine movie segments of up to eight Motion Snapshots to create a single movie. 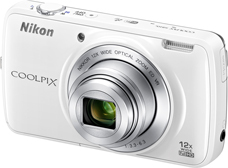 TOKYO -- Nikon Corp. has released the S810c, a Coolpix S-series compact digital camera equipped with Android and WiFi that combines advanced functions with ease of use. The S810c is a single camera that allows users to enjoy taking pictures, viewing them and using them to connect with others. It is equipped with a 12x optical zoom Nikkor lens, 16.0-million pixels and a backside illumination CMOS sensor that support capture of images exhibiting superior image quality. It is also equipped with Android and WiFi support that allow users to upload their high-quality images to social networking services, clouds and the like directly from the camera using familiar operations similar to those used with smartphones. Newly adopted comment function allows users to add comments, such as their impression of the scene, immediately after the shutter is released. This function offers users a new way to enjoy taking and sharing photos. Equipping the camera with Android Ver. 4.2.2 and WiFi support enable familiar operation and communications functions (does not include telephone functions). Simple setup, simple connection. Connecting to the Internet, applying settings and entering text are all performed with operations similar to those used with Android smartphones. Post to and browse, social networking services. Photos and movies recorded with this digital camera, as well as comments, can be posted directly from the camera to social networking services such as Google+ , Facebook and Twitter. In addition to posting, the camera also supports smooth viewing of SNSs. Equipped with Google apps and Google Play support. Users can add and customize functions according to their individual preferences by downloading apps from Google Play. What's more, as the camera comes with Google apps such as Google+, YouTube , Google Maps and Gmail already installed, users can enjoy convenient online contents not strictly related to photography itself with the camera. Transfer images to a smart device. When the dedicated Connect to S810c application is installed on a smartphone or tablet, photos and movies recorded with the S810c can be quickly and easily transferred to the smart device. A 12x optical zoom Nikkor lens that covers the wide-angle 25mm to telephoto 300mm range of angles of view (equivalent focal lengths in 35mm 135 format). The S810c is equipped with a 12x optical zoom Nikkor lens that covers the 25-300mm range of angles of view (equivalent focal lengths in 35mm 135 format). In addition, it is equipped with Dynamic Fine Zoom, which enables approximately 24x zoom for a maximum focal length equivalent to approximately 600mm and with which resolution is preserved in the digital zoom range. The lens also supports macro photography with shooting as close as 2 cm to the center of the lens. Effective pixel count of 16.0-million pixels, backside illumination CMOS sensor. The camera offers an effective pixel count of 16.0-million pixels. This, along with the built-in backside illumination CMOS sensor and vibration reduction function that combines lens shift VR with electronic VR, allows users to enjoy taking photos that exhibit superior image quality. Comment function that allows users to preserve their thoughts or impressions at the moment of capture with images. The camera is equipped with a comment function that allows users to attach comments to images. Comments of up to 400 characters can be entered using the keyboard displayed in the monitor or speech recognition. Not only are users able to add notes, thoughts or impressions to images immediately after the shutter is released, but these comments can also be edited later with image playback. Timeline View that allows users to edit images and comments in in-camera albums. Images with comments can be displayed in chronological order with image playback. In addition, images can be organized in timelines to which titles have been assigned by event, for display similar to that of social networking services with which users are familiar. Nikon Image Space app pre-installed. The Nikon Image Space app pre-installed in the camera allows users direct access to Nikon Image Space, Nikon's image storage and sharing service. This allows users to upload and view their images anytime and anywhere, as if they were always carrying their photo albums with them. What's more, the app supports the camera's comment function, automatically adding comments to SNS boards when images are shared. When users register their S810c, they receive 20-GB of storage space on Nikon Image Space. GPS function (with A-GPS function) that enables recording of location data with photos. The high-performance GPS function built into the S810c records shooting location data (latitude and longitude) with photos. In addition, the camera's A-GPS file can be updated using the built-in WiFi function. Target finding AF. By simply pointing the camera toward the intended subject, the camera instantly predicts the portion on which focus should be acquired and focuses. As precise focusing is performed by focus area automatically specified in accordance with the size of the subject, focus can be acquired on the intended portion. A 3.7-inch, approximately 1229k-dot TFT LCD monitor offering sharp and clear reproduction of even the smallest details. The S810c is equipped with a 3.7-inch, approximately 1229k-dot electrostatic TFT LCD touch screen monitor. Adoption of anti-reflection coating and Clear Color Display with brightness adjustment for the high-resolution WVGA LCD increases visibility for easier operation. TOKYO -- Nikon Corp. has announced the release of the AF-S DX Nikkor 18-300mm f3.5-6.3-GB ED VR, a 16.7x high-power zoom lens compatible with Nikon DX-format dSLR cameras. 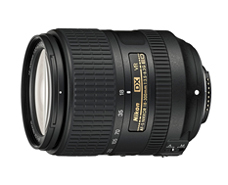 The AF-S DX Nikkor 18-300mm f3.5-6.3-GB ED VR is a 16.7x high-power zoom, 18-300mm (angle of view equivalent to that of a 27-450mm lens in 35mm 135 or Nikon FX format) lens that covers a broad range of focal lengths, from wide-angle to super-telephoto. It is smaller and lighter for greater portability despite its support for a wide range of angles of view, making it a single lens that even those new to dSLR cameras can use to enjoy capturing a wide variety of subjects, such as everyday snapshots, portraits and landscapes. What's more, in addition to superior optical performance for sharp and clear rendering throughout the entire zoom range, achieved with adoption of ED lens and aspherical lens elements, the AF-S DX Nikkor 18-300mm f3.5-6.3-GB ED VR is equipped with a vibration reduction function that provides camera shake compensation equivalent to a 4.0-stop increase in shutter speed. Even when used with a dSLR camera boasting a high pixel count, the image quality performance enabled by these features is maximized for excellent definition and superior rendering. The AF-S DX Nikkor 18-300mm f3.5-6.3-GB ED VR is also equipped with a Silent Wave Motor for fast and quiet autofocusing.